If you’re looking for a mouthwatering key lime pie recipe that isn’t full of sugar and calories – and one that is dairy-free – this Vegan Key Lime Dream Shakeology is the way to go. You can still get the taste of the scrumptious dessert, but you don’t have derail your diet to enjoy it. 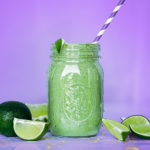 This vegan key lime smoothie is a healthy way to get your key lime fix! Place almond milk, ice, lime juice, Shakeology, maple syrup, and lime peel in blender; cover. Blend until smooth.